Combine un crucero por el Nilo desde Asuán con vuelos desde El Cairo con este paquete de 4 días con todo incluido. Relájese en la cubierta del bote y disfrute del paisaje a orillas del Nilo, deteniéndose en lugares destacados como el Valle de los Reyes, Kom Ombo, el Templo de Philae, el Templo de Hatshepsut y Karnak. Escuche los interesantes comentarios de su guía egiptóloga sobre la historia del antiguo Egipto, que le brindan la oportunidad de aprender mucho más de lo que exploraría por su cuenta. Este tour con todo incluido se ocupa de todos los detalles y facilita un viaje de varios días. Alojamiento nocturno a bordo del crucero. Todas las excursiones y actividades según itinerario. La guía egiptóloga proporciona narración informativa. My advice: just don't! 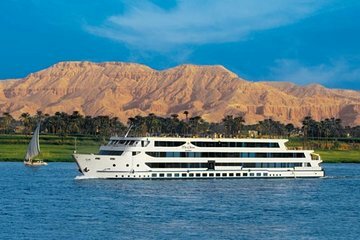 There is no doubt that the Nile is beautiful, but if you want to see it in comfort and luxury, then don't book this one! Despite being told that hotel pick ups and drop offs were included in the price, no one showed up to do it and when I did finally get someone from the company they insisted that I pay. The boat itself, the M/S Suntimes, cannot be described as luxurious by any stretch of the imagination. It is tatty, dirty, old and in need of a complete refurbishment. The restaurant is equally awful with food which made school dinners seem like gourmet food. The other issues I had are too numerous to list, but the whole experience was far from the relaxing, luxurious trip they promise.